Sam Crocker kicks off the new series, picking his favourite African XI in world football at the moment. GK: Kossi Agassa – Consistently ranked amongst the best goalkeepers in Ligue 1, despite the weekly bombardment of shots he receives on a weekly basis behind one of the league’s most rickety defenses, Kossi Agassa’s position for the No.1 jersey was never in doubt. A position that the countries of Africa have hardly been abundant with, Agassa goes against all the stereotypes that are carted out every time an African Cup of Nations comes around, as he provided a sturdy final challenge for oppositions once again this year in South Africa. RB: Emmanuel Eboue – Somewhat of a cult hero/a joke across England, Emmanuel Eboue has been a loyal servant of his country and current club Galatasaray, providing a positive spirit for all to enjoy along the way. Boundless energy as he runs up and down that right touch line like a 5 year-old with ADHD all game long, the man who is a member of the country’s official “golden generation” was a key part of the Ivory Coast’s multiple failed AFCON exploits, and is in a class of his own when it comes to the continent’s attacking full backs. Now being slowly phased-out of the Ivory Coast’s squad in order to facilitate the gradual transition to a new group of players, Eboue will live long in everyone’s hearts. CB: Paul Koulibaly – A man who very much caught my eye during AFCON 2013, he beat his defensive teammate Bakary Kone into my team, based on little more than the fact he is really, really cool. Without being able to comment much on his club side Dinamo Bucharest (though he is about to move to an Iraqi club Al-Shorta, so is a controversial selection), Koulibaly formed an integral part of the Burkinabe team en-route to the final, doing everything with a calm, “I’m completely unaffected by this quite tense situation” sort of look on his face – a look I’m sure he’d maintain even if he was about to be caught in possession on 6 yard line, with 5 opposition players baring down on him, and the keeper looking confused on the edge of the penalty area. CB: Kolo Toure – Oh, where to start with Kolo Toure. As probably my favorite ever football player, I could wax lyrical about him for hours, and was a shoe-in for my European-based African XI. As an Arsenal fan, Toure was an absolutely glorious player during his time in a red shirt, encapsulating a fine balance between Rio Ferdinand’s read-the-game defending and Jamie Carragher last-ditch-tackle defending. One of the very few people on earth to have an Arsenal shirt with Toure’s name on the back, I’d just like to salute this wonderfully honest, slightly awkward player. LB: Benoit Assou-Ekotto – Whilst Cameroon’s presence on the international scene has been fairly limited recently, as off-the-field issues dominate proceedings over the quite novel practice of playing football well for the country, Benoit Assou-Ekotto would be by far the best European based African left-back should his team decide to pull their socks up and get their act together. With the admirable feature of being a no frills, functional sort of player, the man who sees football as little more than something to keep food on the table is the sort of player more children in Cameroon should emulate – the type who turn up and get on with it. DM: Charles Kabore – One of those defensive midfielders who probably shouldn’t be a defensive midfielder based on ball skill alone, but is somehow better than all competition for the role anyway, Kabore acts as a wonderful linchpin between the Burkina Faso defence and midfield. Patrolling and sweeping up wherever he can, he became less and less appreciated during his time at Marseille, sparking a move to Kuban Krasnodar in Russia in 2013. Nevertheless, Kabore plays the role wonderfully well in my book, and will be sorting minimalising the mishaps should this imaginary dream team come together. RM: Jonathan Pitroipa – My player of AFCON 2013, this lanky-yet-not-so-tall winger is consistently a delight to watch at both club and international level. His positive, forward-thinking style of play means he is a hassle to almost all parts of the defence, with his dynamic nature meaning keeping a track of him isn’t always the easiest task in the world. The purveyor of the clichéd “mazy run”, he is the only one if my XI who I believe to have had his own hashtag trending on Twitter, as #JusticeForPitroipa went wild when he was unjustifiably suspended for the 2013 final. 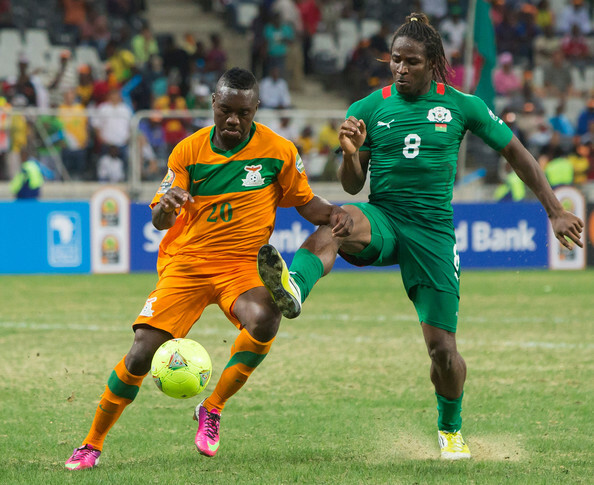 LM: Floyd Ayite – Possibly an unexpected choice, I was thoroughly impressed with Ayite’s performances this year in South Africa, as he proved to be one of the few other threats in the Togo national team beyond star man Emmanuel Adebayor. Forming one of the wingers in the front 3 of a 4-3-3, he is what a lumbering defender like myself would call a “nippy little so-and-so”, and his consistent ability to create chances and get to the byline to square to the awaiting Adebayor meant that Togo were allowed to progress to the latter stages. A consistent starter for Reims this season also, he and fellow countryman Kosi Agassa helped keep the newly-promoted side away from the relegation zone upon their return to the top-flight. AM: Alain Traore – One of the most disappointing mid-tournament injuries since Franco Baresi at the 1994 World Cup, Alain Traore missed out on potentially being the hero of his whole country in South Africa this year, as an injury in the final group match ruled him out for the knock-outs. A sublime player whose scoring record throughout his career has been excellent, he has been consistently on form for both club and country, and rightly managed to keep himself in Ligue 1 upon Auxerre getting relegated last season. Very much on fire for new-cub Lorient in the first half of the season, before he was ruled out for much of the post-AFCON period of Ligue 1, his goalscoring exploits from attacking midfield should be very useful for this team’s success. CF: Dieumerci Mbokani – After arguably the most eye-catching season of his career, Dieumerci Mbokani remains one of my favorite European-based African players, and remains a shoe-in for a front-line role in my XI. After an outrageous first-half of the season with Anderlecht, with his goals per game ratio reaching almost 1 per game, he continued to impress with Democratic Republic of Congo at AFCON 2013. Sadly restricted by their failure to qualify for the latter stages, Mbokani almost defines what I would call the complete striker. Excellent in the air as well as having “good feet for a big man”, it is wonderful to see him recapture his Standard Liege form from a couple of years ago this season with Anderlecht after a couple of years in the wilderness, and cannot wait to see him propel this DRC team to achieve that they know they can achieve. CF: Aristide Bance – Well, well, well – where to start with Aristide Bance. Aside from the obvious brilliance in his facial similarity to King Neptune, it is the heir of surprise that made me fall in love with Aristede Bance, in a selection that is probably akin to a father picking his son up front in an under-14s match. Slightly awkward and bumbling, with no real obvious qualities that stand-out and a fairly poor domestic goal scoring record, it is not obvious what exactly Bance does. But it was most certainly a blessing in disguise when Alain Traore got injured at AFCON 2013, as it allowed Bance to step into the fold up front for Burkina Faso, outperforming Burkinabe legend Moumani Dagano in his first game of the tournament. Encapsulated by his entertaining averageness, it was his panenka in the semi-final penalty shootout against Ghana that truly solidified his place in my heart – a moment that most certainly makes my personal top 10 football moments ever.